Baylor guard LaceDarius Dunn will be available for the Bears on Nov. 22, as it was announced on Friday that the 6-foot-4 senior will be suspended for three games. Dunn had been suspended indefinitely following an arrest last month in which he allegedly broke his girlfriend’s jaw, despite the woman disputing the police reports. Dunn shot 41.9 percent from 3-point range last season, averaging 19.6 points and 4.8 rebounds. 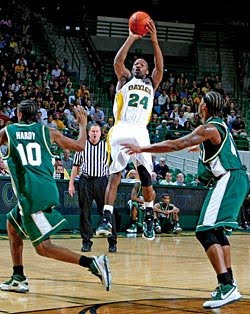 With Tweety Carter and Ekpe Udoh gone from last season’s team, Baylor needs Dunn to return and provide scoring punch. The Bears won their first game without Dunn, beating Grambling State, 87-52. Starting point guard A.J. Walton was serving a one-game suspension. Forwards Quincy Acy and Anthony Jones led the way in the victory, combining for 37 points and 22 rebounds. It looks like the drama surrounding Jelan Kendrick and Memphis is now resolved, as the school announced on Saturday that they would be dismissing the freshman. Gary Parrish of CBSSports.com first reported the news. Kendrick was a McDonald’s All-American last season, but he has had problems since he arrived on the Memphis campus. He was not allowed to go with the team on their exhibition trip to the Bahamas in the summer, and then was suspended by head coach Josh Pastner in the preseason after threatening a teammate. Last week, according to Jason Smith of the Memphis Commercial Appeal, Kendrick was temporarily removed from practice on Thursday for “disruptive behavior” and then suspended for Friday’s game after getting in an argument with a Memphis coach during the pregame shootaround. "Coach and I met and we were like at a crossroads. So we talked. It was a short and respectful conversation and we agreed that it would probably be best that we parted ways," Kendrick said. "I made my share of mistakes, but I love the fans and my teammates and I'm sad that we are where we are. But it's probably for the best." Memphis won its first game of the season on Friday, defeating Centenary, 104-40. Five players scored at least 13 points, led by freshman Antonio Barton’s 17 points and four assists. Wake Forest opened its season with a double-digit loss to Stetson at home on Friday, and then received more bad news when new head Jeff Bzdelik announced that Tony Chennault would miss eight-to-10 weeks with a broken foot. Chennault, a 6-foot-1 freshman from Philadelphia, is the team’s only true point guard and impressed in the loss. He had six points and three assists in just 13 minutes before the injury. Chennault had missed most of the preseason recovering from a stress fracture in the same foot. Without him, C.J. Harris will likely have to take over the primary ball-handling and playmaking duties. He is far more comfortable off the ball, but freshman J.T. Terrell (26 points Friday) is not capable of being a point guard. It will be a long season in Winston-Salem.